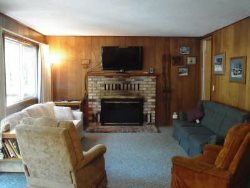 Large sprawling home great for multiple families or just a getaway in the Pines . GREAT light in this home, bright and cheery. Ford Cabin - A Twain Harte original! Just about half way to town and half way to Twain Harte Lake. There is a 3 night minimum stay on the Pine Lodge. Enter the property through the locked gate, ample parking for all. There are 6 stairs to the front deck which allows entrance into the fantastic"living area" where you will find a bar, a great dining table for 6, an extremely open living room with comfy furniture, large TV, fireplace and a regulation pool table. There is a second dining area with table and chairs for 4 which leads into the kitchen, also open to the living area with a great counter and stools. A cheery garden widow brings loads of sun into the well stocked galley. There is a full bathroom on this main level with a large jetted tub and a dressing area with his and hers sinks and counters as well as a HUGE!!! master bedroom with TV, a wood burning stove and a king bed. The laundry room is also on the main level next to the half bath. We must have 24 hour notice prior to your arrival. Upstairs there is a semi private loft with a queen bed, a single bed and a large TV, the second bedroom upstairs has a queen bed and a full bed and there is a small den with a trundle bed. On the lower level is a studio style living area with a kitchenette, loads of living space and a king bed, a second bedroom downstairs has a king and there is a full bath on this level. TONS of room for spreading out!